Do you dream of finding a place to lay your head in Bend that has a bold yet welcoming personality? Tired of motels and boutique hotels that all seem the same? 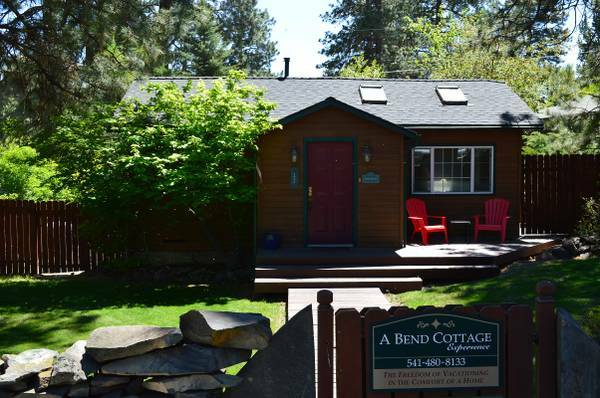 The Sunrise Cottage welcomes you home with her warm living space, great kitchen that is well-stocked down to cork screw and coffee grinder, and two bedrooms (one with KING bed and one with QUEEN bed) and 1 bath. GREAT outdoor space with fully fenced yard so you can bring the pooch along too--- Delightful gazebo with gas grill for those memorable sizzling steaks and corn on the cob. Free WIFI , so you can tweet about beautiful Bend to your jealous friends... or work if you must. Entertain yourself with flat screen TV/DVD/I-Pod dock/ CD and a cache of classic movies we have on hand. Don't over-pack-----we have a full size washer/dryer for those Bend 'play clothes' too. After a day of skiing or boarding, climbing, biking, beer tasting, shopping, concerts, or other FUN STUFF sink into the private HOT TUB and enjoy the stars or snuggle under one of our casually draped snuggle-quilts for those book reading wrap-ups. If you are searching for your home away from home here she is.